As of December 27, 2014 (the last business day of the registrant’s most recently completed second fiscal quarter), the aggregate market value of the registrant’s voting common equity held by non-affiliates was approximately $1,426,808,581. On August 18, 2015, 19,959,995 shares of the registrant's Class A Common Stock were outstanding. The information required by Part III of this report, to the extent not set forth herein, is incorporated by reference from the registrant’s definitive proxy statement relating to the annual meeting of shareholders to be held in November 2015, which definitive proxy statement will be filed with the Securities and Exchange Commission within 120 days after the end of the fiscal year to which this report relates. G&K Services, Inc., founded in 1902 and headquartered in Minnetonka, Minnesota, is a service-focused provider of branded uniform and facility services programs. We deliver value to our customers by enhancing their image and brand, and by promoting workplace safety, security and cleanliness. We accomplish this by providing a wide range of workwear and protective safety apparel through rental and direct purchase programs. We also supply a variety of facility products and services, including floor mats, towels, mops, restroom hygiene products, and first aid supplies. We have a team of 8,000 employees who operate from approximately 165 locations. These locations serve customers in 96 of the top 100 metropolitan markets across the United States and Canada. We serve a diverse base of approximately 170,000 customer locations. We serve customers in virtually all industries, including automotive, warehousing, distribution, transportation, energy, manufacturing, food processing, pharmaceutical, retail, restaurants, hospitality, government, healthcare and others. We provide service to customers of almost every size, from Fortune 100 companies to small and midsize firms. Our largest customer represents approximately 2% of our total revenue. Over one million people within our customer base wear G&K work apparel every work day. Image – work apparel helps companies project a professional image through their employees and frame the perception of credibility, knowledge, trust and quality to their customers. Employees in uniform are perceived as well trained, competent and dependable. Branded work apparel promotes a company's brand identity and allows employees in uniform to convey a company's image. Safety and security – protective work apparel helps protect employees from difficult environments, such as heavy soils, heat, flame or chemicals. Additionally, uniforms help improve workplace security by identifying employees working for a particular company or department. Facility services products, such as floor mats and first aid supplies, also help improve workplace safety. Workplace cleanliness and hygiene – facility services products, such as floor mats, towels, mops, and restroom supplies, help ensure a clean, well-maintained facility, which is safer for employees and more attractive to customers. Employee retention – work apparel enhances worker morale and helps build teamwork in addition to providing a tangible employee benefit. Product protection – work apparel and facility services help protect products against sources of contamination in various industries, including the food, pharmaceutical and health care industries. With a comprehensive understanding of our customers' requirements, we enhance our customers' image and safety by consistently providing superior service and high quality work apparel and facility products and services. Through proprietary tracking systems, a rigorous inspection program, broad product inventories and an accurate measuring system, we promise our customers that deliveries are complete, on time and in good repair. By utilizing advanced technology and offering simple service agreements, we strive to make certain that billing is simple, accurate and predictable. In addition, we employ communication systems and perform closed-loop customer satisfaction practices to ensure our customers' needs are met promptly. We utilize a collaborative approach to advise and assist our customers in choosing a work apparel program that best meets their unique brand, image, identity and safety needs. Our comprehensive range of work apparel and uniform rental programs offers flexibility in styles, colors and quantities, and sets service and distribution expectations to customer requirements. We can quickly source and access garments to provide rapid response as customer needs change due to increases, decreases or turnover in their work force. Professional cleaning, finishing, repair, embellishment and replacement of uniforms in use is a normal part of the rental service. Our handling of the details of a work apparel program allows our customers to focus on running their core business and not be concerned with the management time, operating costs and environmental exposures involved in running their own work apparel program or on-premise laundry. We also offer complete facility services programs that provide a wide range of dust control, maintenance, hand care and hygiene products and services. These programs include floor mat offerings (traction control, logo, message, scraper, anti-fatigue), towel products (shop, kitchen, bar, bath, dish, continuous roll, microfiber), mop offerings (dust, microfiber, wet), fender covers, selected linen items, restroom hygiene products and first aid supplies. Our regularly scheduled weekly service of these products and services helps our customers maintain a clean, safe and attractive environment within their facilities for their employees and customers. Our customers also need a wide selection of branded apparel across a variety of jobs. Our comprehensive direct sale catalog business features a broad product selection, high quality embellishment, efficient distribution and various ordering and payment capabilities. We have developed a vast and comprehensive product offering of the best and hardest working brands in our industry tailored to the needs of our various market segments through our catalog offering. This branded apparel program can be used for uniform programs, employee rewards and recognition, trade shows and vendor appreciation programs. For most of our customers, we provide weekly service, with our highly talented service professionals visiting customers' locations. This regular customer contact helps ensure we are meeting our customers' needs, while promoting strong relationships that lead to high customer retention and additional sales opportunities. Our industry continues to consolidate as many family-owned, local operators and regional companies have been acquired by larger providers. We have historically participated in this consolidation with an acquisition strategy focused on expanding our geographic presence and/or expanding our local market share in order to further leverage our existing production facilities. We remain active in evaluating quality acquisitions that would strengthen our business. We did not complete any acquisitions in fiscal year 2015. We believe many customers in our industry choose providers based on the consistency of superior customer service received, hence our focus on service excellence. The customer-supplier relationship, unique business needs, brand awareness, quality image and improving safety are also key attributes in selecting a uniform provider. In addition, product quality, fit, comfort, price and breadth of products offered are factors in the decision process. We rank among the nation's largest work apparel providers and encounter competition from many companies in the geographic areas we serve. We compete effectively in our core work apparel and facility services business because of our focus on Delivering Uniform Service Excellence. We manufactured approximately 45% of the work apparel that we placed into service in fiscal year 2015. These garments are primarily manufactured in the Dominican Republic. Various outside vendors are used to supplement our additional product needs, including garments, floor mats, towels, mops, linens and related products. Although we occasionally experience product shortages, we are not currently aware of any circumstances that would materially limit our ability to obtain raw materials to support the manufacturing process or to obtain garments or other items to meet our customers' needs. Our operations, like those of our competitors, are subject to various federal, state and/or local laws, rules and regulations respecting the environment, including potential discharges into water and air and the generation, safe handling, storage, transportation and disposal of waste and hazardous substances. We generate certain amounts of waste in connection with our laundry operations, including wastewater, wastewater sludge, waste oil and other residues. In a limited number of instances, certain of these wastes are classified as hazardous under applicable laws, rules and regulations. We continue to make significant investments in properly handling and disposing of these wastes to help ensure safety and compliance with applicable regulations and operating our business, emphasizing our environmental stewardship obligations and responsibilities. We evaluate potential environmental liabilities on a regular basis, and are involved in various property remediation efforts. In particular, we have four projects nearing completion, which we expect will be completed within previously established reserves. We also have four other projects on which we are currently working. Historically, with respect to these projects, we have borne our costs as part of our ongoing operations. As part of these latter efforts, in the fourth quarter of 2015, we determined it was likely that the parties that are contractually obligated to remediate contamination resulting from prior use of perchloroethylene and other dry cleaning solvents, or PCE, at three of our previously purchased locations would not be able to continue to meet these obligations because of their respective financial condition. These acquisitions date as far back as the 1970s; the most recent one was in 2007. As a result of the foregoing, we recorded a charge of $3.9 million to increase our remediation-related reserves for these projects to $4.7 million. In order to determine whether any additional exposure for PCE remediation exists, we have also begun environmental assessments on an additional six sites which we acquired that had historical dry cleaning operations. With respect to these sites, while we believe costs are probable, they are not yet reasonably estimable. Therefore beyond amounts to cover the preliminary assessments, we have not recorded any reserve for these properties. While such charges may be material, we believe the likelihood that any charges will have a material adverse effect on our results of ongoing operations or financial position is remote, although the impact on reported operating results in any particular period may be material. We discuss certain legal matters in this Annual Report on Form 10-K under Part I, Item 1A. Risk Factors - Compliance with environmental laws and regulations could result in significant costs that adversely affect our operating results, Item 3. Legal Proceedings, Item 7. Management’s Discussion and Analysis of Financial Condition and Results of Operations, Item 8. Financial Statements and Supplementary Data in Note 14, "Commitments and Contingencies" of "Notes to Consolidated Financial Statements." While it is impossible to ascertain the ultimate legal and financial liability with respect to contingent liabilities, including lawsuits, legal matters, claims and environmental contingencies, we expect to incur additional charges to remediate PCE contamination at certain sites we have acquired. Based on information currently available, it is also possible that we may incur additional losses in excess of established reserves for other environmental matters unrelated to PCE. While such charges may be significant we believe the likelihood that any charges will have a material adverse effect on our results of ongoing operations or financial position is remote, although the impact on reported operating results in any particular period may be material. Our U.S. operations had approximately 6,700 employees as of June 27, 2015. Approximately 10% of our U.S. employees are represented by various labor unions. Approximately 0.3% of our U.S. employees participate in collective bargaining agreements that expire in the next 12 months. Management believes its U.S. employee relations are good. Our Canadian operations had approximately 1,300 employees as of June 27, 2015. Approximately 65% of our Canadian employees are represented by various labor unions. Approximately 25% of our Canadian employees participate in collective bargaining agreements that expire in the next 12 months. Management believes its Canadian employee relations are likewise good. Financial information relating to foreign and domestic operations is set forth in Note 15, "Segment Information" of the Notes to the Consolidated Financial Statements included in Item 8 of this Form 10-K.
We own a portfolio of registered trademarks, trade names and licenses, and certain U.S. and foreign process and manufacturing patents relating to our business. These proprietary properties, in the aggregate, constitute a valuable asset. We do not believe, however, that our business is dependent upon any single proprietary property or any particular group of proprietary properties. We do not consider our business to be seasonal to any significant extent or subject to any unusual working capital requirements. Our Annual Reports on Form 10-K, Quarterly Reports on Form 10-Q, Current Reports on Form 8-K and any amendments to those reports are available free of charge, as soon as reasonably practicable, after we electronically file such material with, or furnish it to, the United States Securities and Exchange Commission ("SEC"). These reports are available on our website at http://www.gkservices.com and on the SEC's website at http://www.sec.gov. Information included on our website is not deemed to be incorporated into this Annual Report on Form 10-K. The statements in this section, as well as statements described elsewhere in this Annual Report on Form 10-K, or in other filings made with the SEC, describe risks that could materially and adversely affect our business, financial condition and results of operations and the trading price of our securities. These risks are not the only risks that we face. Our business, financial condition and results of operations could also be materially affected by additional factors that are not presently known to us or that we currently consider to be immaterial to our operations. In addition, this section sets forth statements which constitute our cautionary statements under the Private Securities Litigation Reform Act of 1995.
costs of materials and labor, costs and possible effects of union organizing or other union activities, strikes, loss of key management, uncertainties regarding any existing or newly-discovered expenses and liabilities related to environmental compliance and remediation, failure to achieve and maintain effective internal controls for financial reporting required by the Sarbanes-Oxley Act of 2002, the initiation or outcome of arbitrations, litigation or governmental investigations, higher than assumed sourcing or distribution costs of products, the disruption of operations from catastrophic events, disruptions in capital markets, the liquidity of counterparties in financial transactions, changes in federal and state tax laws, economic uncertainties and the reactions of competitors in terms of price and service. We undertake no obligation to update any forward-looking statements to reflect events or circumstances arising after the date on which they are made, except as required by law. Also note that we provide the following cautionary discussion of risks, uncertainties and assumptions relevant to our business. Actual results may differ from certain assumptions we have made causing actual events to vary from expected results. These are factors that, individually or in the aggregate, could cause our actual results to differ materially from expected and historical results. We note these factors for investors as permitted by the Private Securities Litigation Reform Act of 1995. You should understand that it is not possible to predict or identify all such factors. Consequently, you should not consider the following to be a complete discussion of all potential risks or uncertainties. General economic factors may adversely affect our financial performance. General economic conditions may adversely affect our financial performance. Increases in labor costs, including health care, minimum wages, insurance costs, higher material costs for items, such as linens, other textiles and various raw materials, higher fuel and other energy costs, higher interest rates, inflation, higher tax rates and other changes in tax laws and other economic factors could increase our costs of rental and direct sales and selling and administrative expenses and could adversely affect our results of operations. Increased competition could adversely affect our financial performance. We operate in highly competitive industries and compete with national, regional and local providers. Service, product quality, design, fit, comfort, price, breadth of products offered and convenience to the customer are the primary competitive elements in these industries. If existing or future competitors seek to gain or retain market share by reducing prices, we may be required to lower prices, which could be detrimental to our operating results. Our competitors also generally compete with us for possible acquisitions, which can increase the price for acquisitions and reduce the number of available acquisitions. In addition, our customers and prospects may decide to perform certain services in-house instead of outsourcing such services. These competitive pressures could adversely affect our sales and operating results. Failure to comply with the regulations of the U.S. Occupational Safety and Health Administration and other state and local agencies that oversee safety compliance could adversely affect our results of operations. Various federal and provincial regulations apply to our business, as do various regulations promulgated by state and local agencies. For example, the Occupational Safety and Health Act of 1970, as amended, or "OSHA," establishes certain employer responsibilities, including maintenance of a workplace free of recognized hazards likely to cause death or serious injury, compliance with standards promulgated by OSHA and various record keeping, disclosure and procedural requirements. Various OSHA standards apply to our operations. Likewise, as a contractor to the United States government, various regulations promulgated by the Office of Federal Contract Compliance Programs apply to our business. We have incurred, and will continue to incur, capital and operating expenditures and other costs in the ordinary course of our business in complying with these various regulations. Any failure to comply with these regulations could result in fines by government authorities and payment of damages to private litigants, affect our ability to service our customers, result in debarment of us as a contractor to the United States government and adversely affect our financial condition, results of operations and prospects. Compliance with environmental laws and regulations could result in significant costs that adversely affect our operating results. Our operating facilities are subject to stringent environmental laws, rules and regulations relating to the protection of the environment and health and safety matters, including those governing the potential discharges of pollutants to the air and water, the management and disposal of hazardous substances and wastes and the clean-up of contaminated sites. The operation of our business entails risks under environmental laws and regulations. We could incur significant costs, including, without limitation, clean-up costs, fines, sanctions and claims by regulators or third parties for property damage and personal injury, as a result of violations or liabilities under these laws and regulations. As a result of violations of these laws and regulations, among other things, we could be required to reduce or cease use of certain equipment and/or limit or stop production at certain facilities. These consequences could have a material adverse effect on our results of operations and financial condition and disrupt customer relationships. four other projects on which we are currently working. Historically, with respect to these projects, we have borne our costs as part of our ongoing operations. As part of these latter efforts, in the fourth quarter of 2015, we determined it was likely that the parties that are contractually obligated to remediate contamination resulting from prior use of PCE at three of our previously purchased locations would not be able to continue to meet these obligations because of their respective financial condition. These acquisitions date back to the 1970s; the most recent one was in 2007. As a result of the foregoing, we recorded a charge of $3.9 million to increase our remediation-related reserves for these projects to $4.7 million. In order to determine whether any additional exposure for PCE remediation exists, we have also begun environmental assessments on an additional six sites that we acquired that had historical dry cleaning operations. With respect to these sites, while we believe costs are probable, they are not yet reasonably estimable. Therefore, beyond amounts to cover the preliminary assessments, we have not recorded any reserve for these properties. These assessments will inform our next set of actions and could reveal other environmental contamination that needs to be remediated. We expect to incur additional charges to remediate PCE contamination at these sites. Further, based on information currently available, it is possible that we may incur additional losses in excess of established reserves for other environmental matters unrelated to PCE. While such charges may be significant, we believe the likelihood that any charges will have a material adverse effect on our results of ongoing operations or financial position is remote, although the charges in any particular period could be materially affected by changes in our assumptions or strategies related to these contingencies, the imposition of clean-up obligations and the discovery of alleged contamination or changes out of our control. However, these amounts are not estimable at this time. In addition, potentially significant expenditures could be required to comply with environmental laws and regulations, including requirements that may be adopted or imposed in the future. Under environmental laws, an owner or operator of real estate may be required to pay the costs of removing or remediating hazardous materials located on or emanating from property, regardless of whether the owner or operator knew of or was responsible for the presence of such hazardous materials. While we regularly engage in environmental due diligence in connection with acquisitions, we can give no assurance that locations that have been acquired or leased have been operated in compliance with environmental laws and regulations during prior periods, nor can we give any assurance that existing remediation projects or future uses or conditions will not make us liable under these laws or expose us to regulatory or third-party actions, including third party suits. Additionally, we must maintain compliance with various permits and licenses issued to us in connection with our operations, or we must apply for and obtain such permits and licenses. Any failure on our part to maintain such compliance or to apply for and receive such permits and licenses could have a material adverse effect on our ability to continue operations at a particular location. At each reporting period, we assess our operations to determine whether the costs of resolution of legal matters or of investigation and remediation of environmental conditions are probable and can be reasonably estimated, as well as the adequacy of our reserves with respect to such costs. At June 27, 2015, our reserves for remediation-related environmental matters were approximately $4.7 million. We may be subject to information technology system failures, network disruptions and breaches in data security. We rely upon sophisticated information technology systems, infrastructure, and security procedures and systems to operate our business and ensure the secure storage and transmission of information. The size and complexity of our computer systems make them potentially vulnerable to breakdown, malicious intrusion and random attack. Likewise, computer networks and the internet are, by nature, vulnerable to unauthorized access. An accidental or willful security breach could result in unauthorized access and/or use of sensitive data. Our security measures could be breached by third-party action, computer viruses, accidents, or error or misconduct by an employee or contractor. Because techniques used to obtain unauthorized access, disable or degrade service, or to sabotage computer systems, change frequently, it may be difficult to detect immediately and we may be unable to implement adequate preventive measures. Unauthorized parties may also attempt to gain access to our systems or facilities through various means, including hacking into our systems or facilities, fraud, trickery or other means of deceiving employees, contractors and temporary staff. We have encountered threats of this type from time to time, none of which have materially impacted our operations or financial results. Although we maintain a system of information security and controls, a party that is able to circumvent our security measures could cause interruption in our operations, damage our computers or those of our users, or otherwise damage our reputation. Depending on the severity, any of these events could adversely affect our operations and financial results. In addition, if we were to experience an information security breach, we may be required to expend significant amounts to remedy, protect against, or mitigate the effect of the breach, and we may not be able to remedy the situation in a timely manner, or at all. While we have invested in protection of data and information technology, there can be no assurance that our efforts will prevent breakdowns or breaches in our systems that could adversely affect our business. Risks associated with the suppliers from whom our products are sourced, and the cost of those products, could adversely affect our operating results. The products we sell are sourced from a variety of domestic and international suppliers. Global sourcing of many of these products is an important factor in our financial performance. We endeavor that all of our suppliers comply with applicable laws, including, without limitation, labor and environmental laws. Our ability to secure and maintain qualified suppliers who meet our standards and to access products in a timely and efficient manner can be a significant challenge, especially with respect to suppliers located and goods sourced outside the United States. Political and economic stability in the countries in which foreign suppliers are located, the financial stability of suppliers, failure to meet our supplier standards, labor problems experienced by our suppliers, the availability and cost of raw materials to suppliers, currency exchange rates, transport availability and cost, inflation and other factors relating to the suppliers and the countries in which they are located are beyond our control. In addition, United States and Canadian foreign trade policies, tariffs and other impositions on imported goods, trade sanctions imposed on certain countries, the limitation on the importation of certain types of goods or of goods containing certain materials from other countries and other factors relating to foreign trade are beyond our control. Our continued compliance with the disclosure requirements relating to the sourcing of so-called conflict minerals from the Democratic Republic of Congo and certain other adjoining countries as required by the Dodd-Frank Act is predicated upon the timely receipt of accurate information from suppliers, who may be unwilling or unable to provide us with the relevant information. As a result, these requirements could adversely affect our costs, the availability of materials used in our products and our relationships with customers and suppliers. These and other factors affecting our suppliers and our access to products could adversely affect our operating results. Fluctuations in demand for our products and services may adversely impact our financial results. market acceptance of our products and services. If our customers' demand for our products and services decreases, our plant and manufacturing capacity could be underutilized, and we may be required to record an impairment of our long-lived assets, including facilities and equipment, as well as intangible assets, which would increase our expenses. A change in demand for our products and services, and changes in our customers' needs, could have a variety of negative effects on our competitive position and our financial results, and, in certain cases, may reduce our revenue, increase our costs, lower our gross margin percentage, or require us to recognize impairments of our assets. Legal proceedings may adversely affect our financial condition and operating results. From time to time we are party to various legal claims and proceedings, including those relating to employment and regulatory matters. Certain of these claims or proceedings or potential future proceedings, if decided adversely against us or settled by us, may result in a liability that is material to our financial condition and operating results. We discuss current lawsuits and other litigation to which we are party in greater detail under Item 3. Legal Proceedings and Item 8. Financial Statements and Supplementary Data in Note 14, "Commitments and Contingencies" of "Notes to Consolidated Financial Statements." Risks associated with our acquisition strategy could adversely affect our operating results. amount of our management's attention and our financial and other resources. Although we conduct due diligence investigations prior to each acquisition, there can be no assurance that we will discover all operational deficiencies or material liabilities of an acquired business for which we may be responsible as a successor owner or operator. The failure to successfully integrate these acquired businesses or to discover such liabilities could adversely affect our operating results. Increases in fuel, energy and commodity costs could adversely affect our results of operations and financial condition. Motor fuel, natural gas, electricity, cotton, polyester and other commodities represent a significant cost within our business. The price of these commodities, which are required to run our vehicles and equipment and manufacture our garments, can be unpredictable and can fluctuate based on events beyond our control, including geopolitical developments, supply and demand for oil and gas, actions by oil and gas producers, war, terrorism and unrest in oil producing countries, regional production patterns, limits on refining capacities, natural disasters and environmental concerns. Increases in the cost of these commodities could adversely affect our results of operations and financial condition. Failure to preserve positive labor relationships could adversely impact our operations and financial results. Significant portions of our Canadian labor force are unionized, and a lesser portion of United States employees are unionized. While we believe that our Canadian and U.S. employee relations are good, we continue to face pressure from labor unions, and could experience increased pressure. If we do encounter pressure from labor unions, any resulting labor unrest could disrupt our business by impairing our ability to produce and deliver our products and services. In addition, significant union representation would require us to negotiate with many of our employees collectively and could adversely affect our results by restricting our ability to maximize the efficiency of our operations. Inability to attract and retain employees could adversely impact our operations. Our ability to attract and retain employees is important to our operations. Our ability to expand our operations is in part impacted by our ability to increase our labor force. In the event of a labor shortage, or in the event of a change in prevailing labor and/or immigration laws, we could experience difficulty in delivering our services in a high-quality or timely manner and we could be forced to increase wages in order to attract and retain employees, which would result in higher operating costs. Loss of our key management or other personnel could adversely impact our business. Our success is dependent on the skills, experience and efforts of our senior management and other key personnel. If, for any reason, one or more senior executives or key personnel were not to remain active in our company, or if we are unable to attract and retain key personnel, our results of operations could be adversely affected. Unexpected events could disrupt our operations and adversely affect our operating results. Unexpected events, including, without limitation, fires at facilities, security breaches, cyber attacks, natural disasters, such as hurricanes and tornados, public health emergencies, war or terrorist activities, unplanned utility outages, supply disruptions, failure of equipment or systems or changes in laws and/or regulations impacting our business, could adversely affect our operating results. These events could result in disruption of customer service, physical damage or temporary closure of one or more key operating facilities, or the temporary disruption of information systems. Failure to achieve and maintain effective internal controls could adversely affect our business and stock price. Effective internal controls are necessary for us to provide reliable financial reports. All internal control systems, no matter how well designed, have inherent limitations. Therefore, even those systems determined to be effective can provide only reasonable assurance with respect to financial statement preparation and presentation. While we continue to evaluate our internal controls, we cannot be certain that these measures will ensure that we implement and maintain adequate controls over our financial processes and reporting in the future. If we fail to maintain the adequacy of our internal controls or if we or our independent registered public accounting firm were to discover material weaknesses in our internal controls, we will not be able to conclude that we have effective internal control over financial reporting in accordance with Section 404 of the Sarbanes-Oxley Act of 2002. Failure to achieve and maintain an effective internal control environment could cause us to be unable to produce reliable financial reports or prevent or detect fraud. This may cause investors to lose confidence in our reported financial information, which could have a material adverse effect on our stock price. Failure to execute our business plan could adversely affect our business and stock price. Successful execution of our business plan is not assured as there are several obstacles to success, including the economic environment, a competitive industry and entries by us into new markets. In addition, there can be no assurance that our efforts, if properly executed, will result in our desired outcome of improved financial performance. Fluctuations in Canadian currency could have an adverse effect on our results of operations and financial condition. Certain of our foreign revenues and operating expenses are transacted in local currencies. Therefore, our results of operations and certain receivables and payables are subject to foreign exchange rate fluctuations. We occupy approximately 165 facilities located primarily in the United States and Canada. These facilities include our processing, branch, garment manufacturing, distribution and administrative support locations. We clean and supply rental items from approximately 50 facilities located in 38 cities in the United States and nine cities in Canada. We own approximately 94% of our processing facilities, which average approximately 44,000 square feet in size. We are involved in a variety of legal actions relating to personal injury, employment, environmental and other legal matters arising in the normal course of business, including, without limitation, those described below. The United States Office of Federal Contract Compliance Programs, or "OFCCP," is, as part of routine audits, conducting a review of our employment practices. The OFCCP has issued a Predetermination Notice to one of our facilities and Notices of Violation to three others. The OFCCP has raised preliminary allegations of similar violations at five other facilities, but has not issued any Notices of Violations. We have been engaged in discussions with the OFCCP and believe that our practices are lawful and without bias. While we cannot predict the ultimate outcome of these matters with certainty and it is possible that we may incur additional losses in excess of established reserves, we believe the possibility of a material adverse effect on our results of ongoing operations or financial position is remote. We expect to incur charges for environmental remediation for PCE contamination at facilities we own that have historically conducted dry cleaning operations. We discuss current environmental reserves in greater detail in Item 1A. Risk Factors and within our critical accounting policies in Item 7. Management's Discussion and Analysis of Financial Condition and Results of Operations and Supplementary Data in Note 14, "Commitments and Contingencies" of "Notes to Consolidated Financial Statements." We cannot predict the ultimate outcome of these or other similar matters with certainty and it is possible that we may incur additional losses in excess of established reserves. However, we believe the possibility of a material adverse effect on our results of ongoing operations or financial condition is remote, although the impact on reported operating results in any particular period may be material. Our Class A Common Stock, referred to herein as our "common stock," is quoted on the Global Select Market of The NASDAQ Stock Market LLC under the symbol "GK." The following table sets forth the high and low reported sale prices for the common stock as quoted on the Global Select Market of The NASDAQ Stock Market LLC, for the periods indicated. As of August 18, 2015, we had 667 registered holders of record of our common stock. We paid dividends of $24.5 million, $140.9 million and $15.1 million in fiscal years 2015, 2014 and 2013, respectively. Dividends per share were $1.24, $7.08 and $0.78 in fiscal years 2015, 2014 and 2013, respectively. The dividends for the fiscal year 2014 included a $6.00 per share special dividend. We anticipate regular dividends in fiscal year 2016 will total $1.48 per share, or approximately $29.6 million. Our debt agreements contain restrictive covenants, which could limit the amount of cash dividends. See Note 4, "Long-Term Debt" of "Notes to the Consolidated Financial Statements" for further information on our restrictive covenants. The table below sets forth information regarding repurchases we made of our common stock during the periods indicated. As of June 27, 2015, we had a $175.0 million share repurchase program which was originally authorized by our Board of Directors in May 2007 for $100.0 million and increased to $175.0 million in May 2008. Under this repurchase program, we repurchased 266,426 shares in open market transactions totaling $17.6 million in fiscal year 2015 and 204,819 shares in open market transactions totaling $11.7 million in fiscal year 2014. We did not repurchase any shares in fiscal years 2013. At the end of fiscal year 2015, we had approximately $28.6 million remaining under this authorization. In August 2015, our Board of Directors authorized an additional $100.0 million for the share repurchase program. See Note 11, "Stockholders' Equity" of "Notes to the Consolidated Financial Statements". Our Restated Equity Incentive Plan (2013) was approved at our November 6, 2013 annual meeting of shareholders. The outstanding shares listed for this plan include the initial shares authorized under our 2006 and 2010 Equity Incentive Plans, as well as the additional shares authorized when the restated plan was approved. Includes our 1998 Stock Option and Compensation Plan. 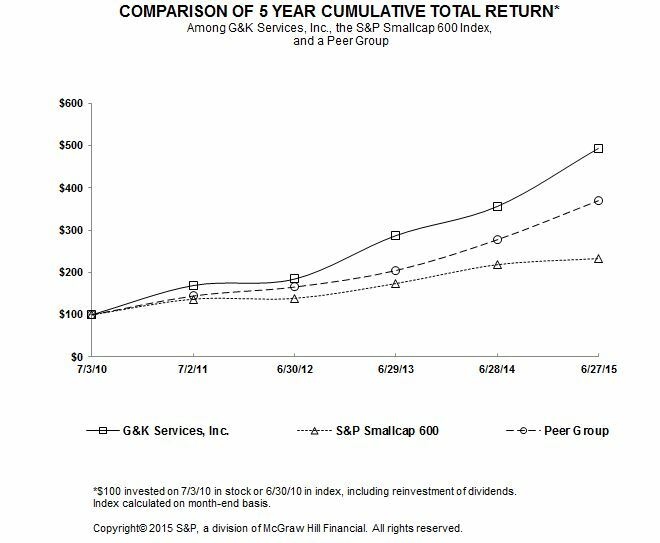 The following graph shows a five-year comparison of the cumulative total return on $100 invested in our common stock, the Standard and Poor’s ("S&P") SmallCap 600 Index and a Peer Group in the uniform services industry, consisting of Cintas Corporation and UniFirst Corporation. The graph illustrates the cumulative values at the end of each succeeding fiscal year resulting from the change in the stock price, assuming a reinvestment of dividends. Over the five year period, G&K stock grew to $493.50, compared to $233.09 for the S&P SmallCap 600 and $370.06 for the Peer Group. The following table sets forth certain selected financial data. All amounts are in thousands, except per share data. We utilize a 52 or 53 week fiscal year ending on the Saturday nearest June 30. All fiscal years presented above represent a 52 week fiscal year. Fiscal year 2012 includes a pretax charge of $24.0 million associated with withdrawing from a multi-employer pension plan (see Note 13, "Employee Benefit Plans" of the Notes to the Consolidated Financial Statements for further information). Fiscal year 2013 includes net pretax charges of $8.2 million related to restructuring and impairment charges and an increase in our estimated liability associated with the exit of a multi-employer pension plan, offset by the benefit of the change in estimated merchandise in-service amortization lives. See Note 1, "Summary of Significant Accounting Policies" and Note 9, "Restructuring and Impairment Charges" of "Notes to the Consolidated Financial Statements" for further information. Fiscal year 2014 includes a pretax charge of $9.9 million associated with the withdrawal from several multi-employer pension plans (see Note 13, "Employee Benefit Plans" of "Notes to the Consolidated Financial Statements" for further information) and a pretax loss of $12.8 million on the divestiture of our Direct Sale Program Business and our Ireland Business (see Note 10, "Discontinued Operations" of "Notes to the Consolidated Financial Statements" for further information), offset by the benefit of the change in estimated merchandise in-service amortization lives of $6.1 million. Fiscal year 2015 includes a pretax charge of $6.5 million associated with the withdrawal from several multi-employer pension plans (see Note 13, "Employee Benefit Plans" of "Notes to the Consolidated Financial Statements" for further information) and a pretax charge of $3.9 million associated with the environmental reserves established (see Note 1, "Summary of Significant Accounting Policies" of "Notes to the Consolidated Financial Statements" for further information). The following discussion and analysis should be read in conjunction with the Consolidated Financial Statements and related notes thereto which are included herein. We utilize a 52 or 53 week fiscal year ending on the Saturday nearest June 30. Fiscal years 2015, 2014 and 2013 were 52 week years. G&K Services, Inc., founded in 1902 and headquartered in Minnetonka, Minnesota, is a service-focused provider of branded uniform and facility services programs. We deliver value to our customers by enhancing their image and brand, and by promoting workplace safety, security and cleanliness. We accomplish this by providing a wide range of workwear and protective safety apparel through rental and direct purchase programs. We also supply a variety of facility products and services, including floor mats, towels, mops, restroom hygiene products, and first aid supplies. Executing this strategy led to significant improvement in our business performance and financial results, including solid organic revenue growth, expanded operating margins, and strong cash flows. We use several financial metrics to measure the progress of our strategy. Our primary focus is on improving profitability, which we measure using operating income margin, and return on invested capital ("ROIC"), which we define as adjusted income from operations after tax, divided by total debt less cash plus stockholders’ equity. We are also focused on driving revenue growth, measured primarily using the organic growth rate, which is calculated using revenue, adjusted for foreign currency exchange rate differences, acquisitions, and divestitures. Finally, we strive to maximize cash flow provided by operating activities. In August 2015, we introduced a new set of financial goals for the company, called our 15/5 Goals. These goals call for the company to achieve 15% operating margin and 15% ROIC, along with 5% or greater average revenue growth within two to four years. Our industry continues to consolidate as many family-owned, local operators and regional companies have been acquired by larger providers. We have participated in this consolidation with an acquisition strategy focused on expanding our geographic presence and/or expanding our local market share in order to further leverage our existing production facilities. We remain active in evaluating quality acquisitions that would strengthen our business. Our operating results are affected by the volatility in commodities, especially cotton, polyester, crude oil and foreign currency exchange rates, which may contribute to significant changes in merchandise and energy costs. We periodically adjust our operations to serve our customers in the most efficient and cost effective manner. As part of these adjustments, we may realign our workforce, close production or branch facilities or divest operations. We are continuously assessing our business and making adjustments as necessary. In the second quarter of fiscal year 2014, we divested our Ireland Business and in the third quarter of fiscal year 2014, we sold our Direct Sale Program Business. These divestitures have been reflected as Discontinued Operations in our Consolidated Statements of Operations. See Note 10, "Discontinued Operations" of "Notes to the Consolidated Financial Statements" for additional information. The discussion of the financial condition and results of operations are based upon the Consolidated Financial Statements, which have been prepared in conformity with United States Generally Accepted Accounting Principles ("GAAP"). As such, management is required to make certain estimates, judgments and assumptions that are believed to be reasonable based on the information available. These estimates and assumptions affect the reported amount of assets and liabilities, revenues and expenses, and disclosure of contingent assets and liabilities at the date of the financial statements. Actual results may differ from these estimates under different assumptions or conditions. Critical accounting policies are defined as the most important and pervasive accounting policies used, areas most sensitive to material changes from external factors and those that are reflective of significant judgments and uncertainties. See Note 1, "Summary of Significant Accounting Policies" of "Notes to the Consolidated Financial Statements" for additional discussion of the application of these and other accounting policies. Our rental operations business is largely based on written service agreements whereby we agree to pick up soiled merchandise, launder and then deliver clean uniforms and other related products. The service agreements generally provide for weekly billing upon completion of the laundering process and delivery to the customer. Accordingly, we recognize revenue from rental operations in the period in which the services are provided. Revenue from rental operations also includes billings to customers for lost or damaged merchandise. Direct sale revenue is recognized in the period in which the product is shipped. Total revenues do not include sales tax as we consider ourselves a pass-through conduit for collecting and remitting sales tax. Estimates are used in determining the collectability of accounts receivable. Management analyzes specific accounts receivable and historical bad debt experience, customer credit worthiness, current economic trends and the age of outstanding balances when evaluating the adequacy of the allowance for doubtful accounts. Significant management judgments and estimates are used in connection with establishing the allowance in any accounting period. We generally write-off uncollectible accounts receivable after all internal avenues of collection have been exhausted. range from six months to four years. In establishing estimated lives for merchandise in service, management considers historical experience and the intended use of the merchandise. We review the estimated useful lives of our in-service inventory assets on a periodic basis or when trends in our business indicate that the useful lives for certain products might have changed. The selection of estimated useful lives is a sensitive estimate in which a change in lives can have a material impact on our results of operations. For example, during the fourth quarter of fiscal year 2013, we completed an analysis of certain in-service inventory assets which resulted in the estimated useful lives for these assets being extended to better reflect the estimated periods in which the assets will remain in service. The effect of the change in estimate increased income from operations by $6.1 million, net income by $3.9 million and basic and diluted earnings per common share by $0.19 in fiscal year 2014 and increased income from operations by $2.6 million, net income by $1.7 million and basic and diluted earnings per common share by $0.09 in fiscal year 2013. In addition, this change resulted in an increase in merchandise in service on the balance sheet of $8.7 million and $2.6 million as of June 28, 2014 and June 29, 2013, respectively. We estimate losses related to inventory obsolescence by examining our inventory to determine if there are indicators that carrying values exceed the net realizable value. Significant factors that could indicate the need for inventory write-downs include the age of the inventory, anticipated demand for our products, historical inventory usage, revenue trends and current economic conditions. We believe that adequate adjustments have been made in the Consolidated Financial Statements; however, in the future, product lines and customer requirements may change, which could result in an increase in obsolete inventory reserves or additional inventory impairments. During the fourth quarter of fiscal year 2013, we recorded additional inventory write downs of $3.6 million as a result of the restructuring of our direct sale businesses, and an evaluation of the recoverability of certain inventory. See Note 9, "Restructuring and Impairment Charges" of "Notes to the Consolidated Financial Statements" for additional details. Of this $3.6 million, approximately $3.0 million has been reclassified to Discontinued Operations as a result of the divestiture of our Direct Sale Program Business in fiscal year 2014. See Note 10, "Discontinued Operations" of "Notes to the Consolidated Financial Statements" for additional details. We accrue various environmental related costs, which consist primarily of estimated clean-up costs, fines and penalties, when it is probable that we have incurred a liability and the amount can be reasonably estimated. When a single amount cannot be reasonably estimated but the cost can be estimated within a range, we accrue the minimum estimated amount. This accrued amount reflects our assumptions regarding the nature of the remedy and the outcome of discussions with regulatory agencies. Changes in the estimates on which the accruals are based, including unanticipated government enforcement actions or changes in environmental regulations, could result in higher or lower costs. Accordingly, as investigations and other actions proceed, it is likely that adjustments in our accruals will be necessary to reflect new information. While we cannot predict the ultimate outcome of any of these matters with certainty, we believe the possibility of a material adverse effect on our results of ongoing operations or financial position is remote, although the impact on reported operating results in any particular period may be material. Accruals for environmental liabilities are included in the "Accrued expenses - Other" line item in the Consolidated Balance Sheets. Environmental costs are capitalized if they extend the life of the related property, increase its capacity and/or mitigate or prevent future contamination. The cost of operating and maintaining environmental control equipment is charged to expense in the period incurred. For additional information see Note 14, "Commitments and Contingencies" of "Notes to the Consolidated Financial Statements." We evaluate potential environmental liabilities on a regular basis, and are involved in various property remediation efforts. In particular, we have four projects nearing completion, which we expect will be completed within previously established reserves. We also have four other projects on which we are currently working. Historically, with respect to these projects, we have borne our costs as part of our ongoing operations. As part of these latter efforts, in the fourth quarter of 2015, we determined it was likely that the parties that are contractually obligated to remediate PCE contamination at three of our previously purchased locations would not be able to continue to meet these obligations because of their respective financial condition. These acquisitions date back to the 1970s; the most recent one was in 2007. As a result of the foregoing, we recorded a charge of $3.9 million to increase our remediation-related reserves for these projects to $4.7 million. likelihood that any charges will have a material adverse effect on our results of ongoing operations or financial position is remote, although the impact on reported operating results in any particular period may be material. The fair value of the purchase price of acquisitions in excess of the fair value of the underlying net assets is recorded as goodwill. Non-competition agreements that limit the seller from competing with us for a fixed period of time and acquired customer contracts are stated at fair value upon acquisition and are amortized over the terms of the respective agreements or estimated average life of an account, which ranges from five to 20 years. We test goodwill for impairment in the fourth quarter of each fiscal year or upon the occurrence of events or changes in circumstances that indicate that the asset might be impaired. We have determined that the reporting units for our goodwill impairment review are our operating segments, or components of an operating segment, that constitute a business for which discrete financial information is available, and for which segment management regularly reviews the operating results. Based on this analysis, we have identified two reporting units as of the fiscal year 2015 testing date. Our reporting units are U.S. Rental operations and Canadian Rental operations, with respective goodwill balances of $270.0 million and $55.1 million, at June 27, 2015. During fiscal year 2014, we divested our Direct Sales reporting unit. Other than this divestiture, there have been no other changes to our reporting units or in the allocation of goodwill to each respective reporting unit in fiscal years 2015, 2014 or 2013. In fiscal years 2015 and 2014, we performed a qualitative assessment to test our reporting units' goodwill for impairment. Based on our qualitative assessment, we determined that it is more likely than not (i.e., a likelihood of more than 50%) that the fair value of all reporting units is greater than their carrying amount and therefore no impairment of goodwill was identified. In fiscal year 2013, we used a market valuation approach to determine the fair value of each reporting unit for our annual impairment test. The results of this test indicated that the estimated fair value exceeded the carrying value of our goodwill by more than 50% for our U.S. Rental and Canadian Rental reporting units and therefore no impairment existed. All goodwill associated with our Direct Sales reporting unit had been previously impaired and written off prior to divestiture. During the second quarter of fiscal year 2014, we recorded an impairment loss related to the divestiture of our Ireland Business of $0.3 million. Long-lived assets, including definite-lived intangible assets, are reviewed for impairment whenever events or changes in circumstances indicate that the carrying amount of such assets may not be recoverable. Recoverability is measured by comparison of the carrying amount of the asset to the future undiscounted cash flows the asset is expected to generate. If the carrying value is not projected to be recovered by future undiscounted cash flows, the amount of any impairment is measured as the difference between the carrying value and the fair value of the impaired asset. During the fourth quarter of fiscal year 2013, we recorded an impairment loss related to customer contracts totaling $1.6 million. See Note 10, "Discontinued Operations" of "Notes to the Consolidated Financial Statements" for details on the impairment. There were no impairment charges for intangible assets in fiscal years 2015 or 2014. Future events could cause management to conclude that impairment indicators exist and that goodwill, other intangibles and other long-lived assets associated with acquired businesses are impaired. Any resulting impairment loss could have a material impact on our financial condition and results of operations. Provisions for federal, state, and foreign income taxes are calculated based on reported pretax earnings and current tax law. Significant judgment is required in determining income tax provisions and evaluating tax positions. We periodically assess our liabilities and contingencies for all periods that are currently open to examination or have not been effectively settled based on the most current available information. If it is more likely than not that our tax position will be denied, we record our best estimate of the resulting tax liability and any applicable interest and penalties in the Consolidated Financial Statements. Deferred tax assets and liabilities are recorded for temporary differences between the tax basis of assets and liabilities and their reported amounts in the financial statements, using statutory rates in effect for the year in which the differences are expected to reverse. We present the tax effects of these deferred tax assets and liabilities separately for each major tax jurisdiction. The effect on deferred tax assets and liabilities of a change in tax rates is recognized in the results of operations in the period that the changes are enacted. We record valuation allowances to reduce deferred tax assets when it is more likely than not that some portion of the asset may not be realized. We evaluate our deferred tax assets and liabilities on a periodic basis. We believe that we have adequately provided for our future income tax obligations based upon current facts, circumstances and tax law. Rental and Direct Sale Revenue. Total revenues in fiscal year 2015 increased 4.1% to $937.6 million from $900.9 million in fiscal year 2014. Our organic growth rate was 5.6% compared to 4.5% in the prior fiscal year. The improvement in the rental organic growth rate from the prior year was primarily due to record new account sales in fiscal 2015, pricing and an increase in direct sales revenue. These increases were offset by the negative impact of foreign currency translation rates. Our organic rental growth rate is calculated using rental revenue, adjusted to exclude the impact of foreign currency exchange rate changes, divestitures and acquisitions. We believe that the organic rental revenue reflects the growth of our existing rental business and is, therefore, useful in analyzing our financial condition and results of operations. Cost of Rental and Direct Sale Revenue. Cost of rental and direct sale revenue, which includes merchandise, production, delivery and cost of direct sale expenses, increased 4.4% to $621.1 million in fiscal year 2015 from $595.0 million in fiscal year 2014. As a percentage of revenue, our gross margin declined to 33.8% in fiscal year 2015 from 34.0% in the prior fiscal year. Cost of rental and direct sale revenue in fiscal year 2014 was favorably impacted by $6.1 million or 0.7% of revenue due to the change in the estimated useful lives for certain in-service merchandise assets, as discussed in Note 1, "Summary of Significant Accounting Policies - Inventory and Merchandise in Service" of "Notes to the Consolidated Financial Statements." Excluding this item, gross margin was 33.3% in fiscal year 2014 and fiscal year 2015 represented an improvement of 0.5%. This improvement was primarily due to the favorable impact of fixed costs absorbed over a higher revenue base, improved productivity in our laundry operations, lower energy costs and improved direct sales margins. These favorable items were partially offset by higher merchandise and employee health insurance costs. Pension Withdrawal and Associated Expenses. As discussed in Note 13, "Employee Benefit Plans" of the Notes to the Consolidated Financial Statements, we recorded total charges of $6.5 million in fiscal year 2015 to increase our previously recorded MEPP withdrawal liability and $9.9 million in fiscal year 2014 related to the probable withdrawal from several of our United States MEPPs. Selling and Administrative. Selling and administrative expenses increased to $208.8 million in fiscal year 2015 from $199.9 million in fiscal year 2014. As a percentage of total revenues, selling and administrative expenses increased to 22.3% in fiscal year 2015 from 22.2% in fiscal year 2014. Fiscal year 2015 included a $3.9 million increase to our environmental remediation liability as discussed in Note 14, "Commitments and Contingencies" of "Notes to Consolidated Financial Statements." Excluding this item, our selling and administrative expenses decreased 0.3% to 21.9%. The decrease was primarily driven by improvements resulting from effective cost control as we leveraged our fixed costs over a higher revenue base. United States. Income from operations increased $5.9 million to $85.2 million in fiscal year 2015 from $79.3 million in fiscal year 2014. The current year operating income included a $6.5 million charge to increase our previously recorded MEPP withdrawal liability and $3.9 million charge related to an increase in our environmental remediation liability and the prior year included a $5.3 million benefit from the change in merchandise lives previously reported and additional expense of $9.9 million associated with our MEPP withdrawal liability. Excluding these items, income from operations increased $11.7 million. The increase was primarily driven by additional income from increased revenue, lower energy costs, productivity improvements in our laundry and delivery operations and improved direct sale margins. These improvements were partially offset by higher worker’s compensation and employee health insurance expenses. Canada. Income from operations decreased approximately $0.8 million to $16.0 million in fiscal year 2015 from $16.8 million in fiscal year 2014. The prior year operating income included a $0.8 million benefit from the change in merchandise lives previously reported. Excluding this item, income from operations was flat. Additional income from increased revenue, improved productivity in our laundry operations, lower vehicle maintenance costs and lower energy costs were offset by a significant decline in the Canadian foreign exchange rate, increased selling costs and corporate allocations. Interest Expense. Interest expense was $7.1 million in fiscal year 2015 compared to $6.3 million in fiscal year 2014. The increased interest expense was due to higher average debt balances resulting from the payment of the special dividend in the fourth quarter of fiscal 2014, partially offset by lower average interest rates. Provision for Income Taxes. Our effective tax rate for fiscal year 2015 decreased to 36.4% from 37.6% in fiscal year 2014. The current period tax rate is lower than the prior year period due to resolution of the fiscal years 2005 to 2007 transfer pricing audit and expiration of certain tax statutes of limitations. Discontinued Operations. In the second quarter of fiscal year 2014, we divested our Ireland Business and in the third quarter of fiscal year 2014, we sold our Direct Sale Program Business. These businesses have been reflected as discontinued operations in our Consolidated Statements of Operations. The pretax loss recognized in fiscal year 2014 includes the loss on sale of $12.8 million and a loss from the discontinued operations of $0.3 million and has been reclassified from continuing operations to discontinued operations. See Note 10, "Discontinued Operations" of "Notes to the Consolidated Financial Statements" for additional information. Rental and Direct Sale Revenue. Total revenues in fiscal year 2014 increased 4.0% to $900.9 million from $866.0 million in fiscal year 2013. Our organic rental growth rate was 4.9% compared to 4.2% in the prior fiscal year. The improvement in the rental organic growth rate from fiscal year 2013 was primarily due to record new account sales in fiscal year 2014, improved customer retention, improved execution related to merchandise recovery billings and uniform preparation services and strong pricing. The carry over impact of an acquisition from fiscal year 2013 added approximately 0.5% to our rental operations growth rate. These increases were offset by the negative impact of foreign currency translation rates and a decline in direct sale revenue. Our organic rental growth rate is calculated using rental revenue, adjusted to exclude the impact of foreign currency exchange rate changes, divestitures and acquisitions. We believe that the organic rental revenue reflects the growth of our existing rental business and is, therefore, useful in analyzing our financial condition and results of operations. an improvement of 1.2%. This improvement was primarily due to the favorable impact of fixed costs absorbed over a higher revenue base, lower payroll taxes, merchandise costs, workers compensation expenses, motor fuel costs and a decreased percentage of incentive compensation costs allocated to cost of rental and direct sale revenue. In addition, gross margins from direct sale improved as a result of the restructuring of our catalog business. These favorable items were partially offset by higher natural gas and vehicle related costs. Pension Withdrawal and Associated Expenses. As discussed in Note 13, "Employee Benefit Plans" of "Notes to the Consolidated Financial Statements," we recorded total charges of $9.9 million in fiscal year 2014 related to the probable withdrawal from four MEPPs and an increase to our previously recorded MEPP withdrawal liability. In fiscal year 2013, we recorded a $1.0 million charge related to our withdrawal from another MEPP. Selling and Administrative. Selling and administrative expenses increased to $199.9 million in fiscal year 2014 from $195.3 million in fiscal year 2013. As a percentage of total revenues, selling and administrative expenses decreased to 22.2% in fiscal year 2014 from 22.6% in fiscal year 2013. The decrease was primarily driven by a $2.6 million restructuring and impairment charge in the prior year, as discussed in Note 9, "Restructuring and Impairment Charges" of "Notes to the Consolidated Financial Statements" which totaled 0.3% of revenue. Excluding this charge, selling and administrative costs were 22.3% of revenue in fiscal year 2013, which is consistent with fiscal year 2014. Improvements resulting from effective cost control as we leveraged our fixed costs over a higher revenue base, decreased amortization expense and lower payroll taxes and pension expense were offset by higher selling, depreciation and equity compensation expense. United States. Income from operations increased $13.1 million to $79.3 million in fiscal year 2014 from $66.1 million in fiscal year 2013. The current year operating income included a $5.3 million benefit from the change in merchandise lives previously reported and additional expense of $9.9 million associated with our MEPP withdrawal liability. The prior year operating income included a $2.3 million benefit from the change in inventory lives and additional expense of $3.2 million related to restructuring and impairment charges and $1.0 million associated with a MEPP liability adjustment. Excluding these items, income from operations increased $15.9 million. The increase was primarily driven by additional income from increased revenue, continued productivity improvements in our laundry operations, improved direct sale margins, lower payroll tax, pension and incentive compensation expenses. These improvements were partially offset by higher selling and employee health care expenses. Canada. Income from operations decreased approximately $1.0 million to $16.8 million in fiscal year 2014 from $17.9 million in fiscal year 2013. The current year operating income included a $0.8 million benefit from the change in merchandise lives previously reported. The prior year operating income included a $0.3 million benefit from the change in inventory lives. Excluding these items, income from operations decreased $1.5 million. The decrease was primarily driven by a decrease in the Canadian foreign exchange rate, which decreased operating income by $1.2 million. In addition, higher selling, natural gas and electricity costs and lower direct sale margins were partially offset by lower merchandise and depreciation expenses. Interest Expense. Interest expense was $6.3 million in fiscal year 2014 compared to $4.9 million in fiscal year 2013. The increased interest expense was due to higher effective interest rates primarily due to the $100.0 million fixed rate notes issued in April 2013, partially offset by lower average debt balances. Provision for Income Taxes. Our effective tax rate for fiscal year 2014 increased to 37.6% from 36.2% in fiscal year 2013. The prior period tax rate is lower than the current year period due to settlement of the fiscal years 2010 and 2011 federal income tax return examinations and expiration of certain tax statutes of limitations. Discontinued Operations. In the second quarter of fiscal year 2014, we divested our Ireland Business and in the third quarter of fiscal year 2014, we sold our Direct Sale Program Business. These businesses have been reflected as discontinued operations in our Consolidated Statements of Operations. The pretax loss recognized in fiscal year 2014 includes the loss on sale of $12.8 million and a loss from the discontinued operations of $0.3 million. The pretax operating loss on these businesses for fiscal year 2013 was $6.0 million and has been reclassified from continuing operations to discontinued operations. See Note 10, "Discontinued Operations" of "Notes to the Consolidated Financial Statements" for additional information. Financial Condition. Our financial condition is strong. In assessing our financial condition, we consider factors such as working capital, cash flows provided by operations, capital expenditures, and debt service obligations. We continue to fund our operations through a combination of cash flow from operations and debt financing. We believe we have sufficient access to capital markets to fund our operations. Our primary sources of cash are net cash flows from operations and borrowings under our debt arrangements. Primary uses of cash are capital expenditures, dividends, acquisitions, working capital needs, payments on indebtedness and general corporate purposes. Net working capital at June 27, 2015 was $219.0 million, a $0.9 million increase from $218.1 million at June 28, 2014. The increase in net working capital was primarily due to an increase in merchandise in service to support our revenue growth. This increase was partially offset by a decrease in inventory resulting from increased inventory turns and an increase in accounts payable due to timing of payments and increased vendor payment terms. Operating Activities. Net cash provided by operating activities was $94.2 million, $74.6 million and $112.1 million in fiscal years 2015, 2014 and 2013, respectively. Cash provided by operations in fiscal year 2015 increased primarily due to a decrease in working capital requirements and lower income tax payments, partially offset by MEPP settlement payments. Cash provided by operations in fiscal year 2014 decreased primarily due to higher working capital to support our revenue growth and higher income tax payments, partially offset by increased net income. Investing Activities. Net cash used for investing activities was $55.8 million, $26.1 million and $54.1 million in fiscal years 2015, 2014 and 2013, respectively. The increase in fiscal year 2015 over fiscal year 2014 was primarily due to an increase in capital expenditures in fiscal year 2015 and the business divestitures in fiscal year 2014. The decrease in fiscal year 2014 over fiscal year 2013 was primarily due to a business acquisition in fiscal year 2013 offset by the business divestiture in fiscal year 2014.
Financing Activities. Net cash used for financing activities was $55.9 million, $49.7 million and $38.0 million in fiscal years 2015, 2014 and 2013, respectively. Cash used for financing activities in fiscal year 2015 was primarily for the repayment of borrowings under our revolving credit facility, payment of dividends, and share repurchases. Cash used for financing activities in fiscal year 2014 was primarily for the payment of dividends, including our special dividend of $6.00 per share, and share repurchases. This was offset by borrowings under our revolving credit facility and proceeds from the issuance of common stock under stock option plans. The borrowings under our revolving credit facility were primarily used to fund the $6.00 per share special dividend. Cash used for financing activities in fiscal year 2013 was primarily for repayments on our revolving credit facility due to strong cash flow and payment of dividends, offset by the issuance of $100.0 million private placement notes and proceeds from the issuance of common stock under stock option plans. We paid dividends of $24.5 million, $140.9 million and $15.1 million in fiscal years 2015, 2014 and 2013, respectively. Dividends per share were $1.24, $7.08 and $0.78 in fiscal years 2015, 2014 and 2013, respectively. In fiscal year 2016, we anticipate regular cash dividends of $1.48 per share, totaling approximately $29.6 million. Capital Structure. Total debt was $243.8 million at June 27, 2015, a decrease of $23.3 million from the prior year balance of $267.0 million. The decrease in debt was primarily driven by strong cash flow. The ratio of debt to capitalization (total debt divided by the sum of the stockholders' equity plus total debt) decreased to 38.2% at June 27, 2015, from 41.7% at June 28, 2014. We believe we will be able to fund all currently anticipated cash requirements for fiscal year 2016, including scheduled debt repayments, new investments in the business, dividend payments and possible business acquisitions, from operating cash flow and our revolving credit facility. See Note 4, "Long-Term Debt" of "Notes to the Consolidated Financial Statements" for details of our long-term debt and information on the refinancing of our revolving credit facility and interest rate swap transactions executed during the fourth quarter of fiscal year 2015. The credit facilities, loan agreements, fixed rate notes and variable rate notes contain various restrictive covenants that, among other matters, require us to maintain a minimum interest coverage ratio and a maximum leverage ratio. These debt arrangements also contain customary representations, warranties, covenants and indemnifications. At June 27, 2015, we were in compliance with all debt covenants and we believe only a material adverse change in our financial performance and condition could result in a potential event of default under the covenants associated with this facility. In the unlikely situation that an event of default would be imminent, we believe that we would be able to successfully negotiate amended covenants or obtain waivers; however, certain financial concessions might be required. Our results of operations and financial condition could be adversely affected if amended covenants or waivers on acceptable terms could not be successfully negotiated. See Note 6, "Derivative Financial Instruments," of "Notes to the Consolidated Financial Statements" for details of our interest rate swap and hedging activities related to our outstanding debt. Cash Obligations. Under various agreements, we are obligated to make future cash payments in fixed amounts. These include payments under the revolving credit facility, capital lease obligations and rent payments required under operating leases with initial or remaining terms in excess of one year. We calculated the estimated interest payments related to credit facilities by using the total debt balance outstanding as of June 27, 2015, and applying the interest rates in effect at that time to future periods. As of June 27, 2015, we have entered into certain interest rate swap agreements whereby we have limited our exposure to future interest rate increases. See Note 6, "Derivative Financial Instruments," of the Notes to the Consolidated Financial Statements for further discussion. At June 27, 2015, we had approximately $308.9 million of available capacity under our revolving and accounts receivable credit facilities. However, borrowings would be limited to $248.4 million due to debt covenant limitations. Our revolving credit facility contributes all of our liquidity as our accounts receivable securitization facility is fully utilized. We anticipate that our cash flows from operations and available capacity under our credit facilities will be sufficient to satisfy our cash commitments and capital requirements for fiscal year 2016. We may utilize borrowings under the revolving credit facility to supplement our cash requirements from time to time. We estimate that capital expenditures in fiscal year 2016 will be approximately $50.0 million. Gross uncertain tax positions as of June 27, 2015 of $8.8 million are not included in the other long-term obligations table presented above because the timing of the settlement of unrecognized tax benefits cannot be reasonably determined. For further discussion, refer to Note 12, "Income Taxes" of our "Notes to Consolidated Financial Statements." At June 27, 2015, we had $22.5 million of stand-by letters of credit that were issued and outstanding, primarily in connection with our property and casualty insurance programs. No amounts have been drawn upon these letters of credit. In addition, we have outstanding operating leases with contractual obligations totaling $109.8 million related to facility, equipment and vehicle leases. We do not utilize special purpose entities to facilitate off-balance sheet financing arrangements. Effective December 31, 2006, we froze our defined benefit pension plan and related supplemental executive retirement plan. Future growth in benefits will not occur beyond this date. We anticipate making cash contributions of approximately $0.8 million in fiscal year 2016. The calculation of pension expense and the corresponding liability requires the use of a number of critical assumptions, including the expected long-term rate of return on plan assets and the assumed discount rate. Changes in these assumptions can result in different expense and liability amounts, and future actual experience can differ from these assumptions. Pension expense increases as the expected rate of return on pension plan assets decreases. We estimated that the pension plan assets will generate a long-term rate of return of 6.50% in fiscal year 2015. This rate was developed by evaluating input from our outside actuary and reference to historical performance and long-term inflation assumptions. The expected long-term rate of return on plan assets at June 27, 2015 is based on an allocation of equity and fixed income securities. As part of our assessment of the expected return on plan assets, we considered historical asset performance and the change in our target asset allocation, and concluded that a reduction to our long term rate to 6.50% was appropriate. Decreasing the expected long-term rate of return by 0.50% (from 6.50% to 6.00%) would increase our estimated fiscal year 2016 pension expense by approximately $0.3 million. Pension liability and future pension expense increase as the discount rate is reduced. We discounted future pension obligations using a rate of 4.70% at June 27, 2015. We determine the discount rate with assistance from our outside actuary by creating a yield curve based on high quality bonds. Decreasing the discount rate by 0.50% (from 4.70% to 4.20%) increases our accumulated benefit obligation at June 27, 2015 by approximately $8.1 million and increase the estimated fiscal year 2016 pension expense by approximately $0.7 million. Future changes in the expected return on plan asset, assumed discount rates and various other factors related to the participants in our pension plan will impact our future pension expense and liabilities. We cannot predict with certainty what the impact of these factors will be in the future. Historically, we participated in a number of collectively bargained, union sponsored multi-employer pension plans ("MEPPs"). Consistent with the accounting for defined contribution plans, we previously recorded the required cash contributions to the MEPPs as an expense in the period incurred and recognized a liability for any contributions due and unpaid. In addition, we are responsible for our proportional share of any unfunded vested benefits related to the MEPPs. An employer's accounting for MEPPs provides that a withdrawal liability should be recorded if circumstances that give rise to an obligation become probable and estimable. As of June 27, 2015, we have withdrawn from, and no longer participate in any MEPPs in the United States. During fiscal years 2015, 2014 and 2013 we recorded total pretax charges related to the exit from all MEPPs of $6.5 million, $9.9 million and $1.0 million, respectively. In addition, during fiscal years 2015, 2014 and 2013, we made total payments related to our MEPP liabilities of $28.9 million, $3.8 million and $1.7 million, respectively. Fiscal 2015 includes a settlement payment to the Central States Fund of $24.8 million. Total remaining reserves for all MEPPs as of June 27, 2015 is $9.3 million. Beginning in fiscal year 2012, we commenced negotiations to discontinue our participation in the Central States Fund. We were ultimately successful and withdrew our participation in the Central States Fund in stages as various union contracts expired. During the third quarter of fiscal year 2015, we entered into settlement discussions with the Central States Fund and on June 11, 2015, we entered into a settlement agreement (the “Settlement Agreement”) with the Central States Fund to resolve matters related to the withdrawal liability and the related arbitration. Pursuant to the Settlement Agreement, we made a lump sum payment to the pension fund in the amount of $24.8 million and agreed to dismiss the arbitration. In addition, the Central States Fund released all claims for collection of the withdrawal liability and related assessments, subject to our representations and warranties regarding contributions to the Central States Fund, related contribution base units and trades or businesses under common control of the company. We funded the payment under the Settlement Agreement through use of existing resources, including our revolving credit facility. As previously disclosed, we have received formal demand notices from other MEPPs to which we previously contributed. Internally and with outside experts, we evaluated each of the demand notices to determine the appropriateness thereof. We have determined that the demanded amounts are appropriate for all but one of the MEPPs. In the case of the MEPP for which we have been unable to verify the amount demanded, we have requested additional information from the MEPP to ascertain the validity and accuracy of the payment demands and accuracy of the assumptions used. To the extent we deem as accurate the information we receive from this fund, we expect that we will resolve this matter. To the extent we deem such information as inaccurate, it is likely that we will file an arbitration against this fund to resolve this matter. In either case, we believe that resolution of this matter will be within previously established reserves. Our Canadian subsidiaries participate in three multi-employer retirement funds, collectively referred to as the Canadian MEPPs. These plans provide monthly retirement payments on the basis of the credits earned by the participating employees. For two of the plans, in the event that the plans are underfunded, the monthly participant benefit amount can be reduced by the trustees of the plan and we are not responsible for the underfunded status of the plan. For the third plan, employers can be held liable for unfunded liabilities and solvency deficiencies and accrued benefits cannot be reduced if there is a deficit unless the employer is insolvent. With respect to our exposure to the third plan, the most recent actuarial valuation as of December 31, 2012 indicates a surplus of approximately 8.8%. In general, we believe that our results of operations are not significantly affected by moderate changes in the inflation rate. Historically, we have been able to manage the impacts of more significant changes in inflation rates through our customer relationships and a continued focus on operational productivity improvements. Our customer agreements generally provide for annual price increases. Significant changes in energy costs, specifically natural gas and motor fuels, and other commodities, can materially affect our results of operations and financial condition. Currently, energy costs represent approximately 3.6% of our total revenue. In the fourth quarter of fiscal year 2013, we closed one of our rental facilities and restructured our direct sale businesses. The rental facility had become redundant as a result of the acquisition we made earlier in the fiscal year. In addition, we made the decision to transition our GKdirect Catalog business to a third-party catalog offering and outsource the fulfillment operations. This change resulted in the discontinuance of certain product offerings and the establishment of $0.6 million of lower of cost or market reserves to reduce the carrying amount of inventory to its estimated net realizable value. In addition, we incurred charges for equipment write-downs and severance related to the closure of a distribution center. Also, as part of our annual fourth quarter impairment test and recent changes in our Direct Sale Program Business, we identified certain impairment indicators that required us to perform an assessment of the recoverability of the long-lived assets related to the business. As part of this assessment, we determined that the carrying value of certain long-lived assets exceeded their fair values. The estimated fair values were determined using a discounted cash flow approach. This analysis resulted in the impairment of certain long-lived assets, including computer software, customer contracts and other property and equipment. Finally, the changes to our Direct Sale Program Business noted above resulted in an evaluation of the recoverability of related inventory. As part of this evaluation we established $3.0 million of additional reserves to reduce inventory to its net realizable value based on our updated business plan. All of the charges related to our Direct Sale Program Business have been reclassified to Discontinued Operations, see Note 10, "Discontinued Operations" of "Notes to the Consolidated Financial Statements" for additional information. We are exposed to market risks. Market risk is the potential loss arising from adverse changes in interest rates, energy prices and foreign currency exchange rates. We do not enter into derivative or other financial instruments for speculative purposes. We are subject to market risk exposure related to changes in interest rates. We use financial instruments such as interest rate swap agreements to manage interest rate risk on our variable rate debt. Under these arrangements, we agree to exchange, at specified intervals, the difference between fixed and floating interest amounts, calculated by reference to an agreed upon notional principal amount. Interest rate swap agreements are entered into for periods consistent with related underlying exposures and do not constitute positions independent of those exposures. The estimated exposure considers the mitigating effects of interest rate swap agreements outstanding at June 27, 2015 on the change in the cost of variable rate debt. The current fair market value of all outstanding contracts at June 27, 2015 was an unrealized gain of $4.7 million. A sensitivity analysis was performed to measure our interest rate risk over a one-year period to changes in market interest rates for forecasted variable rate debt that was not modified by interest rate swaps. As of June 27, 2015, this debt amount was $143.6 million. The two scenarios include measuring the sensitivity to interest expense with an immediate 50 basis point change in market interest rates and the impact of a 50 basis point change distributed evenly throughout the year. Based on the forecasted average variable rate debt level, the forecasted annual expense for our variable rate debt is $1.9 million. The scenario with an immediate 50 basis point change would increase or decrease forecasted interest by $0.7 million or 37.3%. The scenario that distributes the 50 basis point change would increase or decrease interest expense by $0.5 million or 23.6%. For additional information regarding our debt see Note 4, "Long-Term Debt" of "Notes to the Consolidated Financial Statements" as well as the Liquidity, Capital Resources and Financial Condition section of Item 7. Management's Discussion and Analysis of Financial Condition and Results of Operations. We are subject to market risk exposure related to changes in energy costs. To manage this risk, from time to time we have utilized derivative financial instruments to mitigate the impact of motor fuel cost volatility on our future financial results. As of June 27, 2015, we have no outstanding derivative financial instruments related to motor fuels. We performed an analysis to measure the sensitivity of our energy costs to changes in the prices of motor fuels. The analysis used motor fuel prices at June 27, 2015 and forecasted purchases over the next 12 months. For each one percentage point increase or decrease in motor fuel prices under these assumptions, our motor fuel costs would change by approximately $0.2 million. Production costs at our plants are also subject to fluctuations in natural gas costs. To reduce our exposure to changes in natural gas prices, we utilize natural gas supply contracts in the normal course of business. These contracts meet the definition of "normal purchase" and, therefore, are not considered derivative instruments for accounting purposes. Our only material foreign subsidiaries are located in Canada. The assets and liabilities of these subsidiaries are denominated in the Canadian dollar and, as such, are translated into U.S. dollars at the exchange rate in effect at the balance sheet date. Results of operations are translated using the average exchange rates throughout the period. The effect of exchange rate fluctuations on translation of assets and liabilities are recorded as a component of stockholders' equity and are included in the "Accumulated other comprehensive income" line item of the Consolidated Balance Sheets. Gains and losses from foreign currency transactions are included in results of operations. Following is a summary of the results of operations for each of the quarters within the fiscal years ended June 27, 2015 and June 28, 2014. All amounts are in thousands, except per share data. The third quarter of fiscal 2015 includes a pretax charge of $6.5 million associated with withdrawing from a multi-employer pension plan (see Note 13, "Employee Benefit Plans" of "Notes to the Consolidated Financial Statements" for further information). The fourth quarter of fiscal 2015 includes a pretax charge of $3.9 million to increase our environmental remediation liability (see Note 14, "Commitments and Contingencies" of "Notes to the Consolidated Financial Statements" for further information). The second quarter of fiscal 2014 includes a pretax loss of $12.9 million on the sale of our Direct Sale Program Business and Ireland Business (see Note 10, "Discontinued Operations" of "Notes to the Consolidated Financial Statements" for further information). The first quarter of fiscal year 2014 includes a pretax charge of $1.7 million and the third quarter of fiscal year 2014 includes a pretax charge of $8.2 million associated with withdrawing from a multi-employer pension plan (see Note 13, "Employee Benefit Plans" of "Notes to the Consolidated Financial Statements" for further information). Each of the four quarters of fiscal year 2014 were impacted by the benefit of the change in estimated merchandise in-service amortization lives. Our management is responsible for establishing and maintaining adequate internal control over financial reporting for G&K Services, Inc. ("the Company") as defined in Rule 13a-15(f) under the Securities Exchange Act of 1934. Our internal control over financial reporting was designed under the supervision of the Company's principal executive officer, principal financial officer and other members of management, and effected by the Company's Board of Directors, to provide reasonable assurance regarding the reliability of financial reporting and the preparation and presentation of financial statements for external purposes in accordance with generally accepted accounting principles in the United States. Our management completed an assessment of the Company's internal control over financial reporting. This assessment was based on the criteria set forth by the Committee of Sponsoring Organizations of the Treadway Commission ("COSO") in Internal Control-Integrated Framework (1992). Based on this assessment, management has concluded that our internal control over financial reporting was effective as of June 27, 2015. KPMG LLP, the Company's independent registered public accounting firm that audited the fiscal year 2015 consolidated financial statements and schedule and the effectiveness of the Company's internal control over financial reporting, has issued an unqualified attestation report on the Company's effectiveness of internal control over financial reporting, as stated in their report which is included herein. Any internal control system over financial reporting, no matter how well conceived and operated, has inherent limitations. As a result, even those systems determined to be effective can provide only reasonable, not absolute, assurance that the control objectives over the reliability of financial reporting and preparation and presentation of financial statements for external purposes in accordance with generally accepted accounting principles in the United States are met. We have audited the accompanying consolidated balance sheets of G&K Services, Inc. and subsidiaries (the Company) as of June 27, 2015 and June 28, 2014, and the related consolidated statements of operations, comprehensive income, stockholders’ equity, and cash flows for each of the years in the two-year period ended June 27, 2015. In connection with our audits of the consolidated financial statements, we also have audited financial statement Schedule II - Valuation and Qualifying Accounts as of and for the years ended June 27, 2015 and June 28, 2014. We also have audited the Company’s internal control over financial reporting as of June 27, 2015, based on criteria established in Internal Control - Integrated Framework (1992) issued by the Committee of Sponsoring Organizations of the Treadway Commission (COSO). The Company’s management is responsible for these consolidated financial statements, for maintaining effective internal control over financial reporting, and for its assessment of the effectiveness of internal control over financial reporting, included in the accompanying Management’s Report on Internal Control Over Financial Reporting appearing under Item 8 of this Form 10-K. Our responsibility is to express an opinion on these consolidated financial statements and an opinion on the Company’s internal control over financial reporting based on our audits. We conducted our audits in accordance with the standards of the Public Company Accounting Oversight Board (United States). Those standards require that we plan and perform the audits to obtain reasonable assurance about whether the financial statements are free of material misstatement and whether effective internal control over financial reporting was maintained in all material respects. Our audits of the consolidated financial statements included examining, on a test basis, evidence supporting the amounts and disclosures in the financial statements, assessing the accounting principles used and significant estimates made by management, and evaluating the overall financial statement presentation. Our audit of internal control over financial reporting included obtaining an understanding of internal control over financial reporting, assessing the risk that a material weakness exists, and testing and evaluating the design and operating effectiveness of internal control based on the assessed risk. Our audits also included performing such other procedures as we considered necessary in the circumstances. We believe that our audits provide a reasonable basis for our opinions. In our opinion, the consolidated financial statements referred to above present fairly, in all material respects, the financial position of G&K Services, Inc. and subsidiaries as of June 27, 2015 and June 28, 2014, and the results of their operations and their cash flows for each of the years in the two-year period ended June 27, 2015, in conformity with U.S. generally accepted accounting principles. In our opinion, the related financial statement schedule, when considered in relation to the basic consolidated financial statements taken as a whole, presents fairly in all material respects, the information set forth therein, as of and for the years ended June 27, 2015 and June 28, 2014. Also in our opinion, the Company maintained, in all material respects, effective internal control over financial reporting as of June 27, 2015, based on criteria established in Internal Control - Integrated Framework (1992) issued by the Committee of Sponsoring Organizations of the Treadway Commission (COSO). We have audited the accompanying consolidated statement of operations, comprehensive income, stockholders’ equity and cash flow of G&K Services, Inc. and Subsidiaries (the Company) for the twelve months in the period ended June 29, 2013. Our audit also included the financial statement schedule listed in the Index at Item 15 (a). These financial statements are the responsibility of the Company's management. Our responsibility is to express an opinion on these financial statements and schedule based on our audit. In our opinion, the financial statements referred to above present fairly, in all material respects, the consolidated results of operations and cash flows for G&K Services, Inc. and Subsidiaries for the twelve months in the period ended June 29, 2013, in conformity with U.S. generally accepted accounting principles. Also, in our opinion, the related financial statement schedule, when considered in relation to the basic financial statements taken as a whole, presents fairly, in all material respects, the information set forth therein. G&K Services, Inc., founded in 1902 and headquartered in Minnetonka, Minnesota, is a service-focused provider of branded uniform and facility services programs. We deliver value to our customers by enhancing their image and brand, and by promoting workplace safety, security and cleanliness. We accomplish this by providing a wide range of workwear and protective safety apparel through rental and direct purchase programs. We also supply a variety of facility products and services, including floor mats, towels, mops, restroom hygiene products, and first aid supplies. We also manufacture certain work apparel garments that are used to support our garment rental and direct purchase programs. We have two operating segments, United States (includes the Dominican Republic) and Canada, which have been identified as components of our organization that are reviewed by our Chairman and Chief Executive Officer to determine resource allocation and evaluate performance. Our Consolidated Financial Statements include the accounts of G&K Services, Inc. and all subsidiaries in which we have a controlling financial interest. Intercompany transactions and accounts are eliminated in consolidation. Our fiscal year ends on the Saturday nearest June 30. All references herein to "2015," "2014" and "2013" refer to the fiscal years ended June 27, 2015, June 28, 2014 and June 29, 2013, respectively. Fiscal years 2015, 2014 and 2013 consisted of 52 weeks. The preparation of Consolidated Financial Statements in conformity with accounting principles generally accepted in the United States requires management to make estimates and assumptions that affect amounts and disclosures reported therein. Due to the inherent uncertainty involved in making estimates, actual results could differ from our estimates. We consider all investments purchased with an original maturity of three months or less to be cash equivalents. Accounts receivable are recorded net of an allowance for expected losses. The allowance, recognized as an amount equal to anticipated future write-offs, is based on the age of outstanding balances, analysis of specific accounts, historical bad debt experience and current economic trends. We generally write-off uncollectible accounts receivable after all internal avenues of collection have been exhausted. Inventories consist of new goods and rental merchandise in service. New goods are stated at the lower of first-in, first-out cost or market. Merchandise placed in service to support our rental operations is amortized into cost of rental operations over the estimated useful lives of the underlying inventory items, on a straight-line basis, which results in a matching of the cost of the merchandise with the weekly rental revenue generated by the merchandise. Estimated lives of rental merchandise in service range from six months to four years. In establishing estimated lives for merchandise in service, management considers historical experience and the intended use of the merchandise. We review the estimated useful lives of our in-service inventory assets on a periodic basis or when trends in our business indicate that the useful lives for certain products might have changed. The selection of estimated useful lives is a sensitive estimate in which a change in lives can have a material impact on our results of operations. For example, during the fourth quarter of fiscal year 2013, we completed an analysis of certain in-service inventory assets which resulted in the estimated useful lives for these assets being extended to better reflect the estimated periods in which the assets will remain in service. The effect of the change in estimate increased income from operations by $6,136, net income by $3,867 and basic and diluted earnings per common share by $0.19 in fiscal year 2014 and increased income from operations by $2,605, net income by $1,655 and basic and diluted earnings per common share by $0.09 in fiscal year 2013. In addition, this change resulted in an increase in merchandise in service on the balance sheet of $8,741 and $2,605 as of June 28, 2014 and June 29, 2013, respectively. however, in the future, product lines and customer requirements may change, which could result in an increase in obsolete inventory reserves or additional inventory impairments. The reduction in finished goods inventory is primarily related to the sale of our Direct Sale Program Business. See Note 10, "Discontinued Operations" of "Notes to the Consolidated Financial Statements" for details regarding the sale. Costs of significant additions, renewals and betterments are capitalized. When an asset is sold or otherwise disposed of, the related cost and accumulated depreciation are removed from the respective accounts and the gain or loss on disposition is reflected in earnings. Repair and maintenance costs are charged to operating expense when incurred. Depreciation expense, which includes amortization of assets recorded under capital leases, was $30,358, $28,220 and $28,112, in fiscal years 2015, 2014 and 2013, respectively. We accrue various environmental related costs, which consist primarily of estimated clean-up costs, fines and penalties, when it is probable that we have incurred a liability and the amount can be reasonably estimated. When a single amount cannot be reasonably estimated but the cost can be estimated within a range, we accrue the minimum estimated amount. This accrued amount reflects our assumptions regarding the nature of the remedy and the outcome of discussions with regulatory agencies. Changes in the estimates on which the accruals are based, including unanticipated government enforcement actions, or changes in environmental regulations, could result in higher or lower costs. Accordingly, as investigations and other actions proceed, it is likely that adjustments to our accruals will be necessary to reflect new information. While we cannot predict the ultimate outcome of any of these matters with certainty, we believe the possibility of a material adverse effect on our results of ongoing operations or financial position is remote, although the impact on reported operating results in any particular period may be material. Accruals for environmental liabilities are included in the "Accrued expenses - Other" and "Other Noncurrent Liabilities" line items in the Consolidated Balance Sheets. Environmental costs are capitalized if they extend the life of the related property, increase its capacity and/or mitigate or prevent future contamination. The cost of operating and maintaining environmental control equipment is charged to expense in the period incurred. For additional information see Note 14, "Commitments and Contingencies" of "Notes to the Consolidated Financial Statements". We test goodwill for impairment in the fourth quarter of each fiscal year or upon the occurrence of events or changes in circumstances that indicate that the asset might be impaired. Reporting units for goodwill impairment review are operating segments, or components of an operating segment, that constitute a business for which discrete financial information is available, and for which segment management regularly reviews the operating results. Based on this analysis, we have identified two reporting units as of the fiscal year 2015 testing date. Our reporting units are U.S. Rental operations and Canadian Rental operations, with respective goodwill balances of $270,045 and $55,138, at June 27, 2015. During fiscal year 2014, we divested our Direct Sales reporting unit. There have been no other changes to our reporting units or in the allocation of goodwill to each respective reporting unit in fiscal years 2015, 2014 or 2013. In fiscal years 2015 and 2014, we performed a qualitative assessment to test our reporting units' goodwill for impairment. Based on our qualitative assessment, we determined that it is more likely than not (i.e., a likelihood of more than 50%) that the fair value of all reporting units is greater than their carrying amount and therefore no impairment of goodwill was identified. In fiscal year 2013, we used a market valuation approach to determine the fair value of each reporting unit for our annual impairment test. The results of this test indicated that the estimated fair value exceeded the carrying value of our goodwill by more than 50% for our U.S. Rental and Canadian Rental reporting units for both fiscal years and therefore no impairment existed. All goodwill associated with our Direct Sales reporting unit had been previously impaired and written off prior to its divestiture. During the second quarter of fiscal year 2014, we recorded an impairment loss related to the divestiture of our Ireland Business of $261. Long-lived assets, including definite-lived intangible assets, are reviewed for impairment whenever events or changes in circumstances indicate that the carrying amount of such assets may not be recoverable. Recoverability is measured by comparison of the carrying amount of the asset to the future undiscounted cash flows the asset is expected to generate. If the carrying value is not projected to be recovered by future undiscounted cash flows, the amount of any impairment is measured as the difference between the carrying value and the fair value of the impaired asset. During the fourth quarter of fiscal year 2013, we recorded an impairment loss related to customer contracts totaling $1,626. See Note 10, "Discontinued Operations" of "Notes to the Consolidated Financial Statements" for details on the impairment. There were no impairment charges for intangible assets in fiscal years 2015 or 2014. For all significant foreign operations, the functional currency is the local currency. Assets and liabilities of these operations are translated at the period-end exchange rates. Income statement accounts are translated using the average exchange rates prevailing during the year. Translation adjustments are reflected within "Accumulated other comprehensive income" line in stockholders' equity of the Consolidated Balance Sheets. Gains and losses from foreign currency transactions are included in net earnings for the period and were not material in fiscal years 2015, 2014 or 2013. Provisions for federal, state, and foreign income taxes are calculated based on reported pretax earnings and current tax law. Significant judgment is required in determining income tax provisions and evaluating tax positions. We periodically assess our liabilities and uncertain tax positions for all periods that are currently open to examination or have not been effectively settled based on the most current available information. If it is not more likely than not that our tax position will be sustained, we record our best estimate of the resulting tax liability and any applicable interest and penalties in the Consolidated Financial Statements. Deferred tax assets and liabilities are recorded for temporary differences between the tax basis of assets and liabilities and their reported amounts in the financial statements using statutory rates in effect for the year in which the differences are expected to reverse. We present the tax effects of these deferred tax assets and liabilities separately for each major tax jurisdiction. The effect on deferred tax assets and liabilities of a change in tax rates is recognized in the results of operations in the period that the changes are enacted. We record valuation allowances to reduce deferred tax assets when it is more likely than not that some portion of the asset may not be realized. We evaluate our deferred tax assets and liabilities on a periodic basis. We believe that we have adequately provided for our future income tax obligations based upon current facts, circumstances and tax law. In the ordinary course of business, we are exposed to market risks. We utilize derivative financial instruments to manage interest rate risk and manage the total debt that is subject to variable and fixed interest rates. These interest rate swap contracts modify our exposure to interest rate risk by converting variable rate debt to a fixed rate or by locking in the benchmark interest rate on forecasted issuances of fixed rate swap contracts as cash flow hedges of the interest related to variable and fixed rate debt. All derivative financial instruments are recognized at fair value and are recorded in the "Other noncurrent assets" or "Accrued expenses - Other" line items in the Consolidated Balance Sheets. For derivative financial instruments that are designated and qualify as cash flow hedges, the effective portion of the change in fair value on the derivative financial instrument is reported as a component of "Accumulated other comprehensive income" and reclassified into the "Interest expense" line item in the Consolidated Statements of Operations in the same period as the expenses from the cash flows of the hedged items are recognized. Cash payments or receipts are included in "Net cash provided by operating activities" in the Consolidated Statements of Cash Flows in the same period as the cash is settled. We perform an assessment at the inception of the hedge and on a quarterly basis thereafter, to determine whether our derivatives are highly effective in offsetting changes in the value of the hedged items. Any change in the fair value resulting from hedge ineffectiveness is immediately recognized as income or expense. We do not engage in speculative transactions or fair value hedging nor do we hold or issue derivative financial instruments for trading purposes. We grant share-based awards, including restricted stock and options to purchase our common stock. Stock options are granted to employees and directors for a fixed number of shares with an exercise price equal to the fair value of the shares at the date of grant. Share-based compensation is recognized in the Consolidated Statements of Operations on a straight-line basis over the requisite service period for each separate vesting portion of the award. The amortization of share-based compensation reflects estimated forfeitures adjusted for actual forfeiture experience. As share-based compensation expense is recognized, a deferred tax asset is recorded that represents an estimate of the future tax deduction from the exercise of stock options or release of restrictions on the restricted stock. At the time share-based awards are exercised, cancelled, expire or restrictions lapse, we recognize adjustments to additional paid-in capital or income tax expense. See Note 11, "Stockholders' Equity" of "Notes to the Consolidated Financial Statements" for further details. In May 2014, the FASB issued updated guidance to clarify revenue recognition principles. This guidance is intended to improve disclosure requirements and enhance the comparability of revenue recognition practices. Improved disclosures under the amended guidance relate to the nature, amount, timing and uncertainty of revenue that is recognized from contracts with customers. This guidance will be effective for us beginning in the first quarter of fiscal year 2019. We are currently evaluating the impact this new guidance will have on our Consolidated Financial Statements. In April 2015, the FASB issued updated guidance which changes the presentation of debt issuance costs in financial statements to present such costs in the balance sheet as a direct deduction from the related debt liability rather than as an asset. Amortization of the costs is reported as interest expense. This guidance will be effective for us beginning in the first quarter of fiscal year 2017. We anticipate the implementation of this guidance will not have a material impact on the presentation of our financial position and no impact on our results of operations or cash flows. In July 2013, the FASB issued updated guidance to address the presentation of an unrecognized tax benefit when a net operating loss carry-forward, a similar tax loss, or a tax credit carry-forward exists. Specifically, the new guidance requires entities to present an unrecognized tax benefit netted against certain deferred tax assets when specific requirements are met. We adopted these amendments in fiscal year 2015 and they are reflected in our fiscal year 2015 balance sheet presentation and income tax related disclosures. In April 2015, the FASB issued updated guidance, which gives a company whose fiscal year-end does not coincide with a calendar month-end the ability, as a practical expedient, to measure defined benefit retirement obligations and related plan assets as of the calendar month-end that is closest to its fiscal year-end. Early application is permitted and should be applied prospectively. For fiscal year 2015 we early adopted this guidance and it is reflected in our employee benefit plan disclosures. In May 2015, the FASB issued updated guidance to remove the requirement to categorize within the fair value hierarchy all investments for which fair value is measured using the net asset value per share practical expedient. This guidance also removes the requirement to make certain disclosures for all investments that are eligible to be measured at fair value using the net asset value per share practical expedient. These amendments are effective for fiscal years beginning after December 15, 2015, and interim periods within those fiscal years, with retrospective presentation applied to all periods. Earlier application is permitted. This guidance will be effective for us beginning in the first quarter of fiscal year 2017. We anticipate the implementation of this guidance will not have a material impact on the presentation of our financial position and no impact on our results of operations or cash flows. In the second quarter of fiscal year 2013, we completed an acquisition in our rental operations business. The results of the acquired business have been included in our Consolidated Financial Statements since the date of acquisition. The acquisition extended our rental operations footprint into five of the top 100 North American markets which we did not previously serve. The fair value of the consideration transferred at the date of acquisition totaled $18,488 and consisted entirely of cash. The proforma effects of this acquisition, had it been acquired at the beginning of fiscal year 2013, were not material. We recorded a goodwill impairment loss related to the divestiture of our Ireland business of $261 in the second quarter of fiscal year 2014. There were no other impairment losses recorded in fiscal year 2015 or fiscal year 2014. On April 15, 2015, we refinanced our $250,000 unsecured revolving credit facility, which was scheduled to expire on March 7, 2017, with a new five-year $350,000 revolving credit facility ("Unsecured Revolver") maturing on April 15, 2020. Domestic U.S. Dollar borrowings under the new facility bear interest between 1.00% and 1.75% over London Interbank Offered Rate ("LIBOR"), depending on our leverage ratio and can be expanded by $200,000 to a total of $550,000. As of June 27, 2015, there was $40,500 outstanding under this facility. The unused portion of the revolver may be used for general corporate purposes, acquisitions, share repurchases, dividends, working capital needs and to provide up to $45,000 in letters of credit. We intend to use this facility to repay our $75,000 of variable rate unsecured private placement notes which mature on June 30, 2015. As of June 27, 2015 letters of credit outstanding under this facility totaled $636 and primarily related to our property and casualty insurance programs. No amounts have been drawn upon these letters of credit. As of June 27, 2015 there is a fee of 0.175% of the unused daily balance of this facility. Availability of credit under this facility requires that we maintain compliance with certain covenants. Our maximum leverage ratio and minimum interest coverage ratio covenants are calculated by adding back certain non-cash charges, as defined in our debt agreement. Borrowings outstanding as of June 27, 2015 under this facility bear interest at a weighted average effective rate of 1.438%. We had $75,000 of variable rate unsecured private placement notes ("$75M Variable Rate Notes") bearing interest at 0.60% over LIBOR that matured on June 30, 2015. The notes did not require principal payments until maturity. As of June 27, 2015, the outstanding balance of the notes was $75,000 at an effective interest rate of 0.873%. The notes required that we maintained a minimum net worth of $379,953 as of June 27, 2015. We subsequently paid these notes using our new revolving credit facility. Therefore, we continue to classify the $75,000 as long-term debt in the Consolidated Balance Sheets. We have a $50,000 accounts receivable securitization facility ("$50M A/R Line"), which expires on September 27, 2016. Under the terms of the facility, we pay interest at a rate per annum equal to LIBOR plus a margin of 0.75%. The facility is subject to customary fees, including a rate per annum equal to 0.80%, for the issuance of letters of credit and 0.26% for any unused portion of the facility. As is customary with transactions of this nature, our eligible accounts receivable are sold to a consolidated subsidiary. As of June 27, 2015 there was $28,100 outstanding under this securitization facility and there were $21,900 of letters of credit outstanding, primarily related to our property and casualty insurance programs. Borrowings outstanding as of June 27, 2015 under this facility bear interest at an average effective rate of 0.93%. We have $100,000 of fixed rate unsecured senior notes ("$100M Fixed Rate Notes") with $50,000 of the notes bearing interest at a fixed interest rate of 3.73% per annum maturing April 15, 2023 and $50,000 of the notes bearing interest at a fixed interest rate of 3.88% per annum maturing on April 15, 2025. Interest on the notes is payable semiannually. As of June 27, 2015, the outstanding balance of the notes was $100,000 at an effective rate of 3.81%. The credit facilities, loan agreements, fixed rate notes and variable rate notes contain various restrictive covenants that, among other matters, require us to maintain a minimum stockholders’ equity and a maximum leverage ratio. These debt arrangements also contain customary representations, warranties, covenants and indemnifications. At June 27, 2015, we were in compliance with all debt covenants. Level 1 — unadjusted quoted prices that are available in active markets for the identical assets or liabilities at the measurement date. -inputs that are derived principally from or corroborated by other observable market data. Level 3 — unobservable inputs that cannot be corroborated by observable market data and reflect the use of significant management judgment. These values are generally determined using pricing models for which the assumptions utilize management’s estimates of market participant assumptions. We do not have any Level 3 assets or liabilities and we have not transferred any items between fair value levels during fiscal year 2015. See Note 13, "Employee Benefit Plans" of "Notes to the Consolidated Financial Statements" for additional information regarding our pension plan assets. The cash surrender value of life insurance policies are primarily investments established to fund the obligations of the Company's non-qualified, non-contributory supplemental executive retirement plan (SERP). The money market, equity and fixed income mutual funds are investments established to fund the Company's non-qualified deferred compensation plan.